Last September I looked at the question of killer whales injuring other killer whales at marine parks (aggression within wild pods is very rare). Recently, I came across these pictures of some killer whales from the Loro Parque marine park in the Canary Islands. 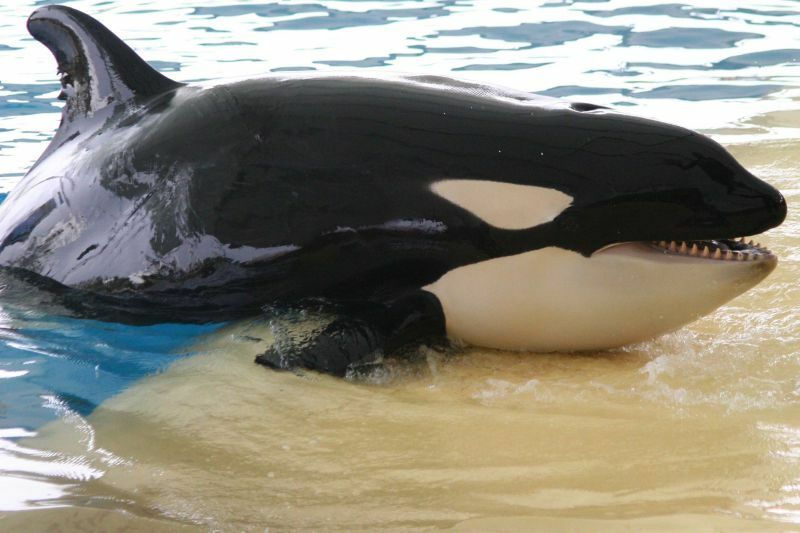 In 2006 SeaWorld loaned four killer whales to Loro Parque: Keto (a 10-year old male) and Tekoa (a five-year old male) were shipped from SeaWorld Texas; and Kohana (a 3-year old female) and Skyla (a 2-year old female) were shipped from SeaWorld Florida. Part of the theory for why marine park orcas injure one another is that the groupings they find themselves in at marine parks are artificial. The groupings have more to do with the park’s needs than they do with family, or orca type ((i.e. killer whales with Icelandic roots might be placed with killer whales that have Pacific roots). And the groupings change as killer whales are moved around from one park to another for breeding, or any number of other reasons (including the need to sometimes separate warring killer whales). In contrast, killer whale groupings in the wild are much more homogeneous, family-based, and stable. They speak the same language. The social order is set along matriarchal lines and killer whales settle into their place over decades. So it is not surprising that there is evidence (see the previous post for some of it) that killer whales in marine parks are much more prone to beating on each other as the social dynamic in marine parks is much more fluid, and the killer whales are less tightly bonded by language and genetics. This, of course, is not an aspect of marine park life that marine parks or their supporters are eager to acknowledge or address. So it is always useful to see pictures that help convey what is happening in the pools. If you have any photos that document this phenomenon of orca on orca aggression in marine park pools, please send them to me and I will post them as well. It is just one of the many factors that affects the life and psychology of killer whales in captivity (for a detailed report on all the factors that contribute to killer whale stress at marine parks, go here). This is already well known, really nothing new. I am thankful someone is willing to bring this to the public. Yes, it is well known in the pro-captive camps, because they follow the orcas religiously. However, the parks do not display this information to the general public to maintain their ‘best place and happy animals’ look. Only those that actually follow them know anything remotely about this. The contrast is that, the parks attempt to hide it behind the fact that the animals are happy and that they take the best care of the animals that they can, when they cannot even control or get the social structures correct. This leads to the animals fighting and bullying each other. Yet, to Mr. Joe Average who visits the park, there is nothing new. Hey, if he sees aggression, they can fob it off that 99.99% of the time things are fine, because chances are he won’t return for a while to see it happen again. I got the 99.99% statement about shows never going wrong during my last visit to the parks, in the very first show where it was interupted by a brutal attack in the opening moments. I went over the course of 5 days and just under 50% of the shows were interupted or had instances of aggression between the animals. You and other pro-captivity people may know it well this occurs frequently, but the average person has no idea that this happens. Orcas are the most beautiful and graceful creatures on this planet. They need to be free to live as they were meant to be… free and in the open waters. They need to be with their personal families and pods and human interaction trying to change that is just plain cruel. Let nature be natural as it should be without human disturbance!!! The youngsters shouldn’t have been moved there, but this is the way the business is. Families are broken up all the time in captivity, even among other highly social or family oriented animals. This article also fails to mention wild orcas enough to explain that families will separate in the wild, and above all that there have been sightings of wild whales with similar markings. 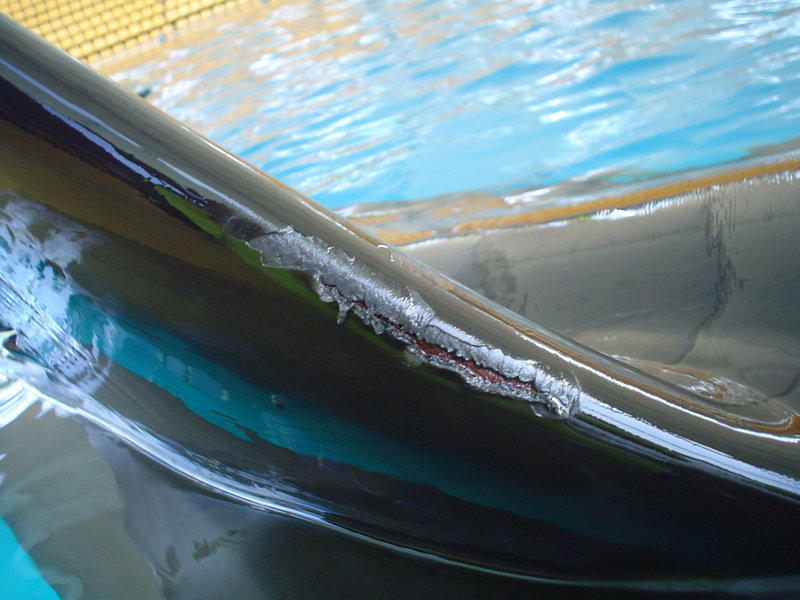 There are certain individuals that are actually identified by the scars they have, whether they are rake marks on their saddles, pieces missing from the dorsal fin, or gashes in their tails. There is also no conclusive evidence to suggest that wild orcas do not get in the similar kind of dominance disputes that captive orcas have….because truth is…we don’t know that much. There is a lot we don’t even see, so assuming that these dominance struggles in captivity are non-existent or even not as intense as those in the wild….is just that…and assumption. Overall this article is just hypocritical Tim, and you’re sounding desperate….if you want to point fingers at SeaWorld then you should also be pointing fingers at many other zoos and aquariums all over the world that move and manage their animals the same. This is the way the captive animal industry is Tim, and considering this is something that has happened over many decades, with many parks, and with many different families of animals, you should broaden your point of view to a bigger picture so you can focus on even more animals, rather than just narrow your vision to the animal you’ve been pretending to know a lot about for the past month. Had the word month on the brain. Thank you for your continued dedication to those without a voice who are being exploited for profit out of pure greed. This excellent article covers truths that some $eaworld fans would rather not face, as it is much easier to “believe” in a faux world that has these highly intelligent , knowing, sensitive beings living happily in undersized, bare, concrete, chlorinated, man made, sonar stifling cement tanks, while flipping their tails to blaring music for food, rather than living in a vast ocean in bloom, in peace and free. Really quite selfish to assume the purpose of these majestic beauty’s is to entertain idiots, and make their trainer look like a rock star wanna be. Selfish and sickening. Yep. I can see why one word may be enough to fill up that brain and not allow much more room for further thoughts. BTW, your response looks a bit desperate and hypocritical. Thanks for the comment, Tina. I showed these pics and the others in the previous post to wild orca researchers, and they say they have never seen injuries like that in the wild. They say that there is superficial raking, but that the injuries are never this severe. That doesn’t mean it doesn’t happen. It just means they haven’t seen evidence of it. So I guess the theory in the post (that there is more aggression in captivity) could be wrong, though I’m not sure why that would make it hypocritical. In any case, there IS plenty of evidence that the marine parks need to manage their kill whale social orders carefully because of whale on whale aggression, and even so there are injuries. And, sure, I think it is not a problem that is SeaWorld’s alone, but likely a problem of captivity across many zoos and many species. It’s just that I came across photos of injured SeaWorld orcas, so that’s what I posted about. I think that it would also be good to point out that when orcas in the wild have scars or injuries, that oftentimes you don’t know where they came from. Due to the fact that they live in an ocean with other creatures, it is quite likely that a portion of the injuries that orcas sustain in the wild do *not* come from other orcas. (whereas, in captivity, that’s the only place they could be from). This is in nearly 40 years of scientific observation! There are researchers here that have studied these small wild orca populations for this entire time period, devoting their lives to understanding and protecting them. So, Tina, though YOU may not know that much about natural orca behavior, these highly-respected researchers certainly do. It is quite obvious that you have received your skewed information from SeaWorld. You continue to regurgitate this same info that ONLY sources from there and not any respected expert of wild orca behavior. Great pics showing the damage! Generally only “pro-caps” and a few “anti-caps” know about and see these issues. This is a nice beginning for the average person who does not know about this behavior. In the wild orca’s have the space to get away where as in captivity they are soooo limited to where they can go when dominance behavior is being displayed. To me, that is one of the cruelest aspect for them in captivity…. A large number of wild orca’s fins are damaged due to boats whiled for some species of orca’s natural elements regarding hunting play a part in fin damage…. not so much one another & dominance behavior as in captivity. Tim fighting for Orca’s is where he needs to be right now….the facts have been hidden from the public for far too long regarding Orca’s in captivity. There is tons of information regarding other animals in captivity unlike the orca’s. The only logical reason I can see, others would want to Tim to stray from the orca’s/SeaWorld is if they do not want the truth to be shown to the world. Tim keep up the awesome work! Thank you for writing these fantastic articles. I always share them on Facebook. These animals are clearly unhappy in captivity, even the ones, like these four, that were born there! What a horrifying life — to live confined in a small, artificial environment, away from your real family, performing monotonous stunts all day for the mere entertainment of camera-toting tourists. Thank you again, Tim, for these wonderful things you do for our animal friends. Keep up the amazing work! Decline in Ehtics and Values was one of the reasons for Rome´s fall. Disregard for human and animal life resulted in a lack of ethics – a perverted view of what was right and wrong, good and bad. We cannot expect those in captivity to behave differently than if humans were kept in a closet and fighting for the one seat in the corner. It is unnatural for them to be kept in a bathtub with chemicals and dead fish for food…Unnatural…sad…Thank you for educating and sharing. Interesting article. It should be noted that it is not clear whether the bite was intentional or an accident amidst a feeding frenzy. The article also notes that “there is no recorded evidence that killer whales attack their own kind.” Thanks for posting the link. It is the same with wolves as well, their pack is man-made and not necessarily from the same pack and that is why there are sometimes dominance struggles. In the wild they are all family members so dominance struggles never take place. It is time we stopped interfering with nature for our ‘so called’ entertainment and left nature to take care of its own. All animals are precious and should be treated with respect and compassion. It is also well-known that orcas and other cetaceans display these behaviors in the wild. Rake marks and other abnormalities are actually how many whales are identified. No one is disputing that fact. Even the scientists. The difference is the –amount– of raking that occurs from other orca. Wild orca have considerably less raking than captive orca due to the fact in the wild they can flee and run away. 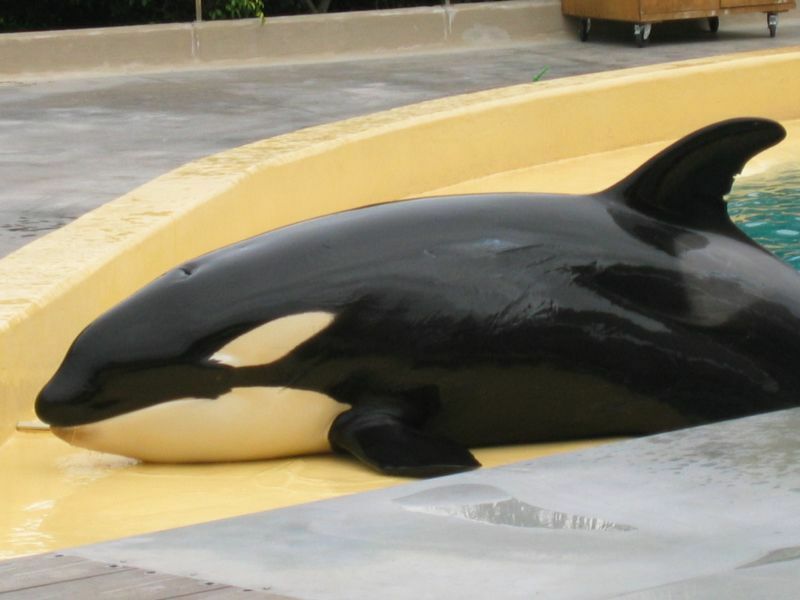 In captivity, there is nowhere to run, so the orca is forced to be abused again and again and again. 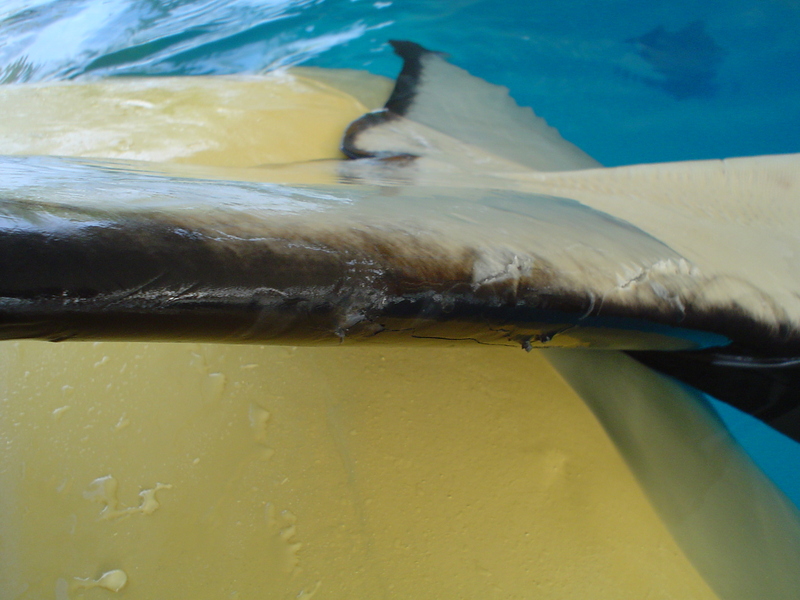 Tekoa at Loro Parque looked like he’d been through a cheese grater from all the attacks he was forced to endure. Also, wild orca can sustain rakes from other predators and prey, rocks and other various things in the wild, while all the captive rakes come from other orca. So when a captive orca has more rakes on them from other orca solely compared to a wild orca with less rakes that can come from many more sources, there –is– a problem.